Right off the bat, this is not intended as a technical blog but more for small business owners who have heard of or used Terminal Servers and are now wondering how this compares to VDI. We also hate acronyms, so I’ll make sure that I’ll explain exactly what they mean before using them. First things first. 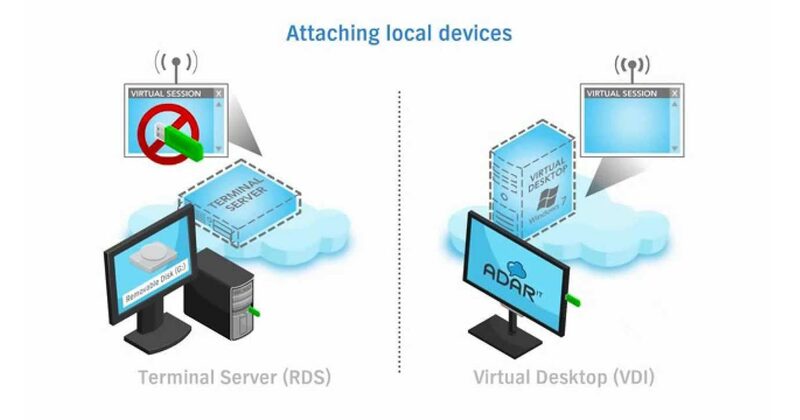 VDI stands for “Virtual desktop infrastructure” and is a phrase coined by a company called VMware a few years ago. Terminal Services has come on a long way in the last few years and for this blog I’m going to be talking about terminal services as it is today and often referred to as SBC (server based computing). So the term VDI is causing a lot of noise in the IT industry and there is a huge amount of marketing hype around this as the next big thing. It’s not quite worked out like that yet for lots of reasons. The biggest reason is complexity followed by cost. However these things are changing daily. Anyway both Terminal Services and VDI and are very much for different types of company. So what is the difference between the two? Although they both provide the same virtual desktop service there are substantial differences between them. So what, if any, is the best option for your company? In SBC your desktop only exists for the time you’re logged on then it is destroyed until you log on again and get a new session. Your colleagues also have a session and you all live on the same virtual server. Whereas VDI there is an individual virtual server for each user that is just exclusively for them. The benefits of the VDI model is that you can control the experience of that individual user whereas with SBC any centrally made changes to the virtual server positive or negative will affect all users on that server. Another advantage of VDI is the ability to install your own applications. (Now you may wonder why this is an advantage if you can do this already in your current environment running a PC locally?) Well, see the next point. In SBC environments you can not install your own browser plugins or small desktop applications. This goes back to the fact that your desktop is destroyed once you log off. At this stage you are probably thinking why would anyone use SBC over VDI? Well, wait, there is more! First let’s deal with the fact that using SBC your desktop is destroyed. There are some advantages to this. As a business owner this means you can control within reason what windows based applications are being used, and ensure that you are in compliance regarding licensing and that no unauthorised applications are installed. Also any nasty virus or malware that are picked up whilst using SBC are also destroyed on logoff. You know the feeling you get when you have a brand new computer and it runs really smoothly? Well that’s what you get with SBC every time you log on a brand new desktop. One important point to add is that all of your user settings and favourites are all saved and extracted before log off and then injected again at logon. The next thing is the Microsoft Windows operating system. With SBC the operating system is in fact a server operating system that is made to look and feel exactly like Windows 7 whereas with VDI you can have either the full version of Windows 7. To be 100% honest most people will not know or notice the difference, and in reality there is very little difference in experience. However there is one difference that really separates SBC and VDI and that’s price! So far if both technologies were the same price I am guessing you would choose VDI right? Well, the price is different because of a few factors including licensing, hardware requirements and complexity. At the moment it’s price and a fear of the unknown that is delaying a mass adoption of VDI. However it is driving more sales of SBC. We provide both at 404 as we are aware different companies have different requirements. With the huge influx of tablets entering the enterprise it is inevitable that people will want access to their Windows desktops and or applications from these devices and either of these technologies can provide that. You can dig around into the real nitty gritty of the technologies to find other differences and i’m sure some more technical people would even argue some of these points, but I hope this helps you understand the fundamental differences between the two. If you have more questions please leave a comment or hit the contact page.